A team of scientists writing in the academic journal “Nature Communications” have identified a new species of giant, prehistoric penguin. This new species, named Kumimanu biceae is not closely related to previously described giant penguins and this suggests that gigantism in penguins evolved several times in the evolution of these birds. K. biceae was described based on a partial skeleton excavated from the Palaeocene Moeraki Formation at Hampden Beach in the Otago region in New Zealand’s South Island. An accurate size is difficult to establish based on the fragmentary fossil remains, but when swimming with its long beak and flippers extended, this bird could have measured more than two metres in length. When on the shore, it would have stood around 1.7 metres tall. The new fossil is one of the oldest giant penguins found so far and is clearly outside a clade including the giant Eocene and Oligocene Sphenisciformes, substantiating multiple origins of gigantism in fossil penguins. Kumimanu biceae stood around 1.7 metres tall and weighed over 100 kilos. The partial skeleton represents a single individual and the fossil material consists of a fragment of a left scapula, an incomplete right coracoid, a portion of the sternum, a partial left humerus, incomplete proximal end of left ulna, a right femur, a right tibiotarsus lacking proximal end, a partial synsacrum, three vertebrae and various bone fragments. The giant penguin’s name comes from Maori myth, kumi was a large, mythical monster and manu means bird. The species or trivial epithet honours Beatrice (Bice) A. Tennyson, the mother of one of the paper’s authors, Alan Tennyson of the Museum of New Zealand Te Papa Tongarewa. It was Alan’s mother who first inspired him to take an interest in natural history. The fossil material is believed to be somewhere between 59.5 and 55.5 million years old. Kumimanu biceae fossils compared to other penguins. The picture above shows the wing and pectoral girdle bones of the new giant penguin. (a) shows the partially prepared concretion with bones in situ, whilst (b) shows the partial right coracoid, the dotted lines indicate the reconstructed outline of the bone. The left coracoid of the prehistoric penguin species Waimanu tuatahi (c) is shown for a size comparison. 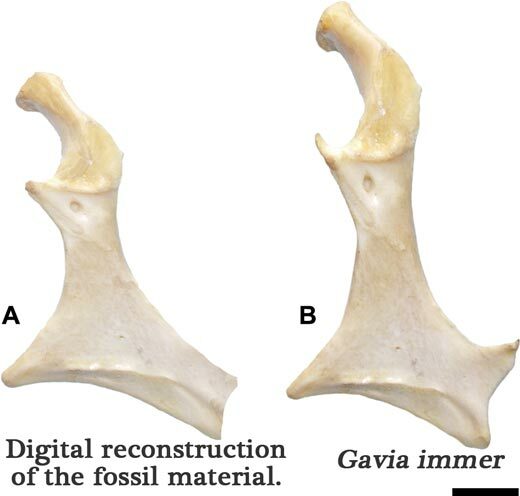 Pictures (d-f) show the fragmentary end of the left ulna of K. biceae in various views, whilst pictures (g-h) depict a left ulna of an as yet, undescribed new species of penguin from the Waipara Greensand. A CT image of the surface of the partial left humerus of K. biceae is shown in (i) whilst (j) shows the exposed surface of the bone. Pictures (k-l) show the humerus with minimum (k) and maximum (l) size estimates for the bone based on the partial fossil material. The left humerus of the Palaeocene penguin Crossvallia unienwillia is shown (m). C. unienwillia was one of the largest known prehistoric penguins. The left humerus of another giant penguin, Pachydyptes ponderous from the late Eocene of New Zealand (n) is provided for further comparison. The scale bars in the picture above equate to 5 cm. The research team conclude that based on the fragmentary fossils, Kumimanu biceae is amongst the largest of the fossil penguins reported so far and since it seems more basal to the family than other giant forms, this suggests that gigantism evolved several times over the long history of penguin evolution. As the year draws to a close, it is time to reflect on some of the blog articles that we have produced over the last twelve months or so. It has certainly been an amazing year for palaeontology with lots of new fossil discoveries and some fascinating new insights into previously described species. With over 300 articles to choose from on this blog, here is the list of our favourites produced in 2017. Back in January, we reported on the remarkable duplication of a famous dinosaur study first undertaken in 2009, when dinosaur collagen was found within fossil bone. A team of researchers from North Carolina State University, North-western University and the University of Texas – Austin, were able to repeat the experiment and retrieve collagen peptides from an 80-million-year-old dinosaur femur. In 2018, we can expect the next instalment of the “Jurassic Park/Jurassic World” to arrive in cinemas, even with this research, we are a long way from resurrecting dinosaurs. Everything Dinosaur’s report on the discovery of a giant worm in Devonian sediments in late February caused one or two shivers amongst our readers. It seems that the vertebrates had a rival for dominant, apex predator in marine environments. Step forward Websteroprion armstrongi, with its vicious jaws. Websteroprion attacking a Devonian fish. Richard Hunter provides the scale next to the giant Sauropod print. Scale depiction of dinosaur provided below. Hunter David Bradt won’t forget on Elk hunting trip that he undertook. Whilst hunting in Montana’s Charles M. Russell National Wildlife Refuge, he stumbled across some large fossil bones in a stream bed. He thought that he had found a dinosaur but no, had uncovered the fossilised remains of a new species of short-necked Elasmosaur from the Western Interior Seaway. The marine reptile was named Nakonanectes bradti in April 2017. Hunter David Bradt photographed in the stream bed with the fossils. There were several newly described dinosaurs in 2017 too. Lots of different types. For example, in August Everything Dinosaur reported on the naming of a new Cretaceous Sauropod from Tanzania. This fossil discovery helps to open up a new area of research into Titanosaur diversity in the southern hemisphere during the Cretaceous. Nearer to home, the Dorset coast also sprang a few fossil surprises student Grant Smith found two fossil teeth in Early Cretaceous sediments on the “Jurassic Coast” that proved the presence of placental mammals in this location. It was amazing to think that the Dorset coast, one of the most explored and research palaeoenvironments in the world, could still hold some surprises and well-done to the relatively inexperienced undergraduate student for making such an incredible discovery. The new placentals were named Durlstodon and Durlstotherium. It of course, gives us another opportunity to post up some of Mark Witton’s beautiful artwork. Purbeck Lagoon 145 mya as darkness falls Durlstodon (top left) looks on whilst two Durlstotherium scurry through the undergrowth. In the centre a Durlstotherium has been caught by Nuthetes destructor. These are just some of our favourite blog articles of 2017, we look forward to all the exciting discoveries and fossil finds we will report on in 2018. News agencies from China are reporting that Chinese palaeontologists have been given a special Christmas present with the discovery of the fossilised remains of a clutch of dinosaur eggs that date from the Early Cretaceous. Construction workers were examining large boulders that had been blasted away as part of the preparations for a building project in Dayu County (Jiangxi Province, south-eastern China), when they noticed the series of white, semi-circular marks in the sandstone rocks, along with a number of almost complete oval-shaped eggs. A close view of one of the fossilised dinosaur eggs from the Dayu County construction site (Jiangxi Province). The clutch of eggs was found on December 25th. Excavation work in the immediate vicinity was suspended and the area cordoned off to prevent any further damage to the fossil find. The fossils were inspected by local scientists under the supervision of the authorities with strict security in order to deter any would-be egg fossil thieves. Officials look on whilst local scientists examine the dinosaur eggs. Despite the removal and sale of such ancient artefacts having been made illegal in China, unfortunately, there is still a thriving black market in fossils, especially fossils of dinosaurs. Everything Dinosaur has reported on several fossil theft cases from China. For example, earlier this year, Everything Dinosaur reported on the arrest of a Chinese man from Zhejiang Province over the alleged theft of more than eighty dinosaur egg fossils. Local scientists examine the dinosaur egg fossils. The fossils of more than twenty dinosaur eggs have been taken away to a local museum for further study and preparation. The site, which is a construction project for a new school, will be inspected closely before further building work takes place in case more fossils are at this location. A spokesperson for the local museum stated that the fossils are around 130 million years old (Early Cretaceous). A team of scientists writing in the on-line academic journal PLOS One have named a new species of Late Cretaceous marine bird, based on a single coracoid bone and some fragments representing bones from the wing. The animal has been named Maaqwi cascadensis and at an estimated 1.5 kilos in weight it was about the same size as your average domestic chicken. However, this bird is believed to have been adapted to a marine environment, using its legs to paddle around under water in pursuit of fish. Fossils of birds from the Pacific Coast of North America are exceptionally rare, these marine deposits that form part of the Northumberland Formation have yielded fossil fish, marine reptile remains plus fragmentary elements of terrestrial animals including dinosaur bones, but very few avian fossils. M. cascadensis was discovered on Hornby Island. The strata are estimated to represent Late Campanian to Early Maastrichtian deposits (around 73 to 71 million years old). The fossil specimen consists of a mudstone concretion which contains a right coracoid bone plus fragmentary wing bones (humerus, ulna and radius). The location of the Late Cretaceous fossil bird find. In the picture above (A) provides the geographical setting of British Columbia in Canada, whilst (B) shows the location of Hornby Island in the context of Vancouver Island. The larger map (C) shows Hornby Island with the Northumberland Formation exposures highlighted in black. The yellow star in (C) shows the location of the fossil discovery. An initial description of the fossil material had been published previously (2011), but it was only with further cleaning and preparation that the full extent of the fossil material became known. Photographs and accompanying line drawings of the fossil material. In the picture (above) photograph (A) shows the dorsal face of the right coracoid and the partial humerus (c and h) with an accompanying line drawing (B). Photograph (C) shows the reverse side of the fossil (ventral) revealing more of the wing bones (u = ulna and r = radius). A line drawing of the reverse side of the fossil is provided (D). Note the scale bar (1 cm). In the line drawings white shading denotes preserved cortical bone (dense bone found towards the outside of bones), whilst the light grey shading shows exposed trabecular bone (spongy internal bone). The dark grey/black represents the mudstone matrix. The size of the coracoid bone suggests a large bird, one weighing around 1.5 kilos. The bones are robust with thickened walls, suggesting that this prehistoric bird was adapted for diving, such as modern grebes and loons. The coracoid (part of the shoulder bones), is very reminiscent of the coracoid of extant diving birds (Gavia immer – the Common Loon). The digital reconstruction of the coracoid of Maaqwi cascadensis compared to the coracoid of an extant bird (Common Loon – Gavia immer). Scale bar = 1 cm. An assessment of the arm bones (ulna, radius and humerus) suggests that M. cascadensis had short wings. It is not known whether this bird was flightless, the wings were probably not the main means of propulsion through water. It has been speculated that the feet were used to propel the bird underwater, in a similar way to the swimming action of cormorants, if this is the case, then Maaqwi probably had webbed feet. The research team propose that this bird was a member of the Ornithurae, a natural group which includes the common ancestor of Ichthyornis, Hesperornis and all modern birds. The generic name, Maaqwi, is derived from “ma’aqwi”, from the language of the indigenous Coast Salish people of the North-west Pacific. The word means “water bird”. The specific name or trivial name, cascadensis, reflects provenance in the Cascadia region of western North America. The scientists including Nicholas Longrich (University of Bath), propose that Maaqwi cascadensis might have been a sister taxon to Vegavis iaai of the Antarctic and along with the Ichthyornithes and Hesperornithes, M. cascadensis and Vegaviidae appear to represent a third clade of bird that evolved to exploit marine habitats in the Late Cretaceous. To read an article about the voice box of Vegavis iaai: Ancient Bird Voice Box Sheds Light on the Voices of Dinosaurs. The big day has finally come and on behalf of everyone at Everything Dinosaur, we would like to wish everybody a Merry Christmas. Compliments of the season to one and all. Over the festive period, Everything Dinosaur will be monitoring emails and sorting out orders for customers. We will also commence our annual stock take, with plenty of mince pies to keep us going. In the next few weeks, Everything Dinosaur will be receiving something like fifty new models, it certainly is an exciting time for us and our many thousands of customers all over the world. Our Christmas picture this year, reflects the new models coming into stock and also takes a nod in the direction of “Fallen Kingdom”, the new “Jurassic World” movie due to be released in June 2018. Santa Claus might be full of cheer, but in the Dinosauria when it comes to “claws”, look out for the fearsome thumb claw of Baryonyx. The Baryonyx in the picture is one of four, exciting new Mojo Fun replicas coming into stock at Everything Dinosaur and in “Fallen Kingdom”, Baryonyx is one of the new dinosaurs to feature. Merry Christmas from Everything Dinosaur. A special thank you to all our customers and fans of dinosaurs who sent into Everything Dinosaur cards, seasonal emails and even pictures of dinosaurs in Christmas scenes. Most of these have been pinned up around the warehouse and the offices, they will help to keep us smiling as we undertake this year’s stock take Our thanks once again for all the messages of support. Over the next few days and weeks we will be compiling all the new fact sheets for the CollectA models, making room in our warehouse for the Beasts of the Mesozoic range and we have a shipment of PNSO replicas to look forward to. Lots to write about over the Christmas holidays but in the meantime, we would like to wish all our readers a very Happy Christmas! 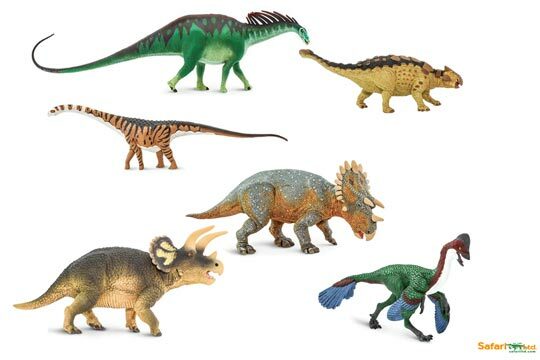 Yesterday, Everything Dinosaur focused on the new dinosaur models for 2018 being introduced by Safari Ltd. In this blog article, we take a look at the other non-dinosaur models that have been added, these models including the Dimetrodon replica along with the dinosaurs, are all in stock and available from Everything Dinosaur. New for 2018 synapsids from Safari Ltd.
Usually, it is quite straightforward when it comes to categorising new models from a manufacturer, but with the fourteen figures stocked by Everything Dinosaur, a couple of them present us with a dilemma. Firstly, we have included the “Winners Circle” Safari Ltd Przewalski’s horse, this is a replica of the world’s only truly wild horse, an animal that very nearly went extinct in the 20th Century, but a dedicated zoo breeding programme enabled these magnificent animals to be re-introduced to some specially selected wildlife refuges. Once this horse (Equus ferus przewalskii), was a common site across the Mammoth Steppe, it has even been depicted in cave paintings. As an animal of the Ice Age very much at home with Mammoths and Mastodons, we have added this model of Przewalski’s horse to our replica range. As this magnificent equine has not, thankfully, died out, we could not call the eight non-dinosaur models that we have stocked extinct animals, but these new for 2018 figures from Safari Ltd have given us another problem, one with a big sail on its back. The addition of a Dimetrodon also adds a degree of complexity when it comes to coming up with a collective term for these new models. Although often mistaken for a dinosaur, any self-respecting primary school pupil will soon correct you, if you mistakenly state that the sail-backed reptile is a dinosaur. Dimetrodon lived long before the first dinosaurs, it is a member of the Pelycosaurs and as such, it is actually more closely related to the prehistoric mammals depicted in the Safari range than it is to the dinosaurs. Dimetrodon and its relatives, like the mammals are Tetrapods, whose skull morphology differs from those Tetrapods on the dinosaurs/crocodiles/birds side of the tree of life. They are synapsids, distinguished by a single hole, known as the temporal fenestra, in the skull, located behind the orbit towards the back of the skull. Dinosaurs and their relatives on the other hand, are diapsids, they have a pair of openings in the skull behind the eye socket, an upper and lower temporal fenestra. We can’t refer to these Safari Ltd models as mammals, as Dimetrodon is the exception, being a reptile, but they are all synapsids. Wild Safari Prehistoric World Dimetrodon model. As well as the stunning Dimetrodon and the beautiful replica of Przewalski’s horse, Safari Ltd have added a Hyaenodon gigas, Uintatherium, Megacerops, Macrauchenia, a Daeodon and a model of an American Mastodon (Mammut americanum). Each of these new figure is supplied with its very own fact sheet, so collectors can learn about the creature that the model represents.